Imagine falling in love with the portrait of a woman who is presumed dead. The life-like representation, however accurate, draws the interest of the detective investigating the case. His job is to learn everything about this woman in order to solve her murder. In the process, he falls in love with the concept he has conceived from the woman’s effects and her striking portrait. Why exactly does this woman appeal to him? Is the imagined woman an ideal personification? Would the real woman match or even be able to compete with being placed on the proverbial pedestal? Knowledge of this story was first brought to my attention in an usual way. I’d seen a revue show at the Resorts Casino in Atlantic City sometime around the early 1990s. IT features well-known musical pieces from movies and more. One sequence was introduced in a recorded video by Merv Griffin. He introduced a dance sequence inspired by the theme song from the movie, Laura. Late at night, a detective having fallen in love with the woman in the portrait sees her come to life. This introduction intrigued me. I sought out the movie, and now, years later, I’ve finally obtained and read the book it was based on. 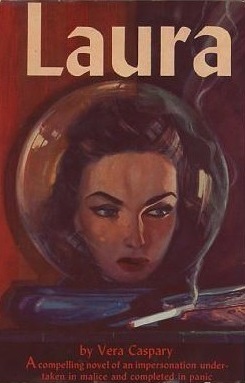 Laura appears as #44 on the Mystery Writers of America Top 100 Crime Novels list. It is a well-told tale that is accessible, captivating, and suspenseful. It is narrated by three of the characters, and divided into five parts. One part is a police transcript of an interview with one of the suspects. The last part is a brief summation of the case’s denouement by the investigating detective who also narrates the second part. In the month of August on a Friday evening, someone rang the bell of Laura Hunt’s brownstone apartment and, when the door was answered, fired off a shotgun killing the woman and disfiguring her face. Mark McPherson, known for taking on high profile political cases involving racketeers, is assigned the murder case. The first chapter, first scene is Mark interviewing Lydecker about the crime. When Lydecker remarks about Mark’s seemingly leisurely investigation, the detective remarks, “There are times in the investigation of a crime when it’s more important to look at faces.” This will especially hold true during the second part of the story in which Mark narrates an unexpected return. Indeed, the relationship between the detective and this key witness/potential suspect is a curious one. There is a near camaraderie that develops between these two men who have come to love Laura in their own way. The earlier camaraderie will eventually shift into a rivalry. Then then unexpected occurs. Mark is drawn to Laura’s apartment on the Wednesday night following the murder. He rests in a chair and “then I saw her.” Not the portrait, but the woman herself returning to her apartment unaware that she had been targeted by a killer and that another woman was killed in her stead. Yes, Laura is alive. But as the story progresses, certain revelations raise the question of whether Laura is as innocent as she appears. Her genteel Southern beau seems to be covering for her. Was she really the intended victim after all? Laura herself takes a turn at narration in Part Four. Her scattered approach could lead readers to question her motives. She’s not in love with the man she intended to marry. She had motive to kill the victim, and her alibi is lacking. Is she being framed? Or is she a true femme fatale leading us all down the garden path? In spite of having seen the movie, I began to wonder if the novel may hold a different ending to the familiar tale. After all, films often deviate from their source material. Certainly there had already been a few differences I noted between the novel and film. It is truly a finely crafted novel that can lead you to wonder if your expectations aren’t correct! Writers, and readers, will find the multi-viewpoint narration a marvel and very well-done. Each narrator is distinct in tone and voice. As a whole, the novel, written in 1941 (and published two years later), is more than worthy of inclusion on top crime novel lists. The novel was famously adapted as a film in 1944 by Otto Preminger and starred Gene Tierney as Laura, Dana Andrews as Mark, and Clifton Webb as Waldo. Vincent Prince and Dame Judith Anderson rounded out the cast.